Beth Ellen Hendlin, D. D. S.
Dr. Beth Ellen Hendlin was born in Syracuse NY. She Attended Queens College and graduated with a BA. During college she was employed at Queens General Hospital as an assistant in the oral surgery clinic. She received her dental training at The University of Maryland at Baltimore. She completed her DDS degree in 1986 and joined Weiss& Michaels a group practice in Forest Hills Queens as an Associate at that time. Dr. Hendlin has been a dentist for 28 years and went into solo practice in Forest Hills, NY, three years later in 1989. 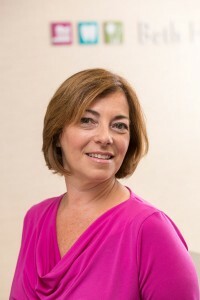 In 2004 Dr. Hendlin sold her practice and joined the practice of Catalano, Leifer and Bruno, the largest general dental practice in Greene County NY where she has been an associate for the last 9 years. She was formerly the attending dentist at two local nursing homes The Pines and The Fireman’s Home. Dr. Hendlin is an active member of the American Dental Association and the NY State Dental Society. She was a member of the NY Dental Forum when practicing in NYC and is a member of the Seattle Study Club, in which she still participates. When not helping her patients obtain healthy and beautiful smiles she enjoys cooking, baking, dancing, hiking with her dogs, and spending time with her family.